Quake Champions is now fully free-to-play, “permanently.” After an array of free weekends and deep discounts, the Quake revival is now completely free, and will be that way forever. Exact details on the post free-to-play monetization model aren’t here yet, but you’ll be able to get the full unlock Champion pack for less than $20. Today’s announcement also showcases the return of the Death Knight, who’s in the game right now – complete with sword and fireballs. On the more technical side, we’re also promised better matchmaking and improved bots, which should help to smooth out some of the more substantial complaints levied at Champions so far. There’s also a brand new soundtrack for the game on the way. If you want to play Quake Champions right now, you’ll get an exclusive gun for playing during QuakeCon, and the game will offer boosted rewards for playing all this month. The developers clearly want you in-game, and they want you in right now – if you want to respond to the call, you can download the game on Steam. There’s plenty of other news out of QuakeCon, of course. 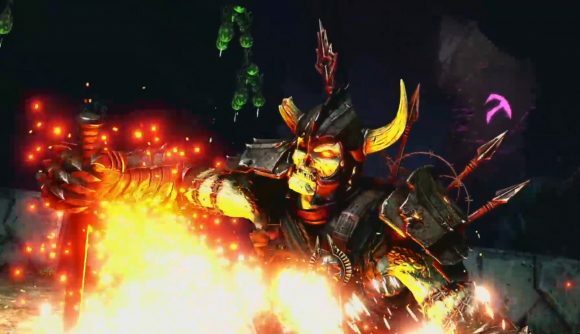 Check out the Doom Eternal trailer or the Rage 2 trailer for extensive looks at the biggest games of the show.